Carol, the critically acclaimed, multiple nominated (BAFTA, Academy Awards etc. ), and Cannes Film Festival winner is released on DVD and Blu-ray today (21st March). Quite frankly, if you haven’t heard of Carol, where have you been? 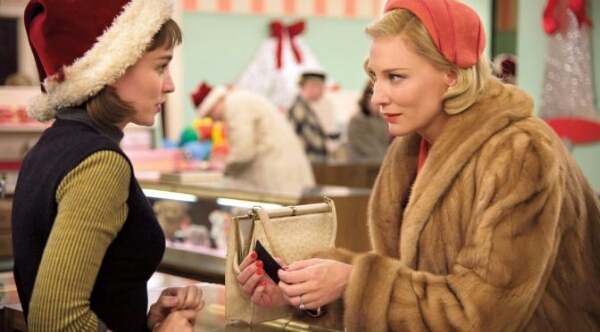 The hype is well deserved, but it’s not what makes Carol such an affecting film. Set in the 1950’s America, and based on Patricia Highsmith‘s classic novel, The Price Of Salt – Carol stars Cate Blanchett and Rooney Mara in an intimate and tender portrayal of love in a time when being gay is seen as forbidden, hidden and oppressed by society. Class and age differences further defy convention. Despite these elements being apparent, Carol doesn’t zero in on these details; they are a given. Instead, it focuses on the simple truth of two people drawn together who fall in love with one another in a beautifully told romance, that is cinematically stunning in fifties elegance. Carol is an upper-class, middle-aged housewife in the process of divorcing her husband and seeking custody of her young daughter (who is her world) when she meets Therese, a young shop worker in a department store, and wannabe professional photographer. Soon the pair are raising eyebrows as their closeness becomes apparent to friends and Carol’s husband, Harge (Kyle Chandler) when they take a trip away together over Christmas. With Harge already aware of Carol’s previous relationship with her best friend Abby and his anger that she doesn’t love him, decides to send a private investigator to record the lovers tryst, giving him ammunition to fight for sole custody on the grounds of ‘immorality’. The film portrays a coming of age story as the two women come to realise who they are and how they want to live their lives forcing Carol and Therese to decide if to be true to their love and be together, or part and live a lie. Both actors give a classy, subtle performance, especially Mara as Therese, who seems to convey an array of feelings with a look in her eyes. Both Blanchett (as Carol) and Mara sizzle with an apparent chemistry without the film feeling sappy or forced. Carol is out to buy now.